Words fail to describe the vast engineering feat that is Hadrian’s Wall. I have always wanted to visit this ancient Roman wall, built to keep the “barbarians” out of the Roman Kingdom. It is a real wonder. We hiked along part of the wall amid its magnificent backdrop of rolling hills and wild moorland. The weather was terrible, torrential rain all day long, but somehow this made it even more dramatic. 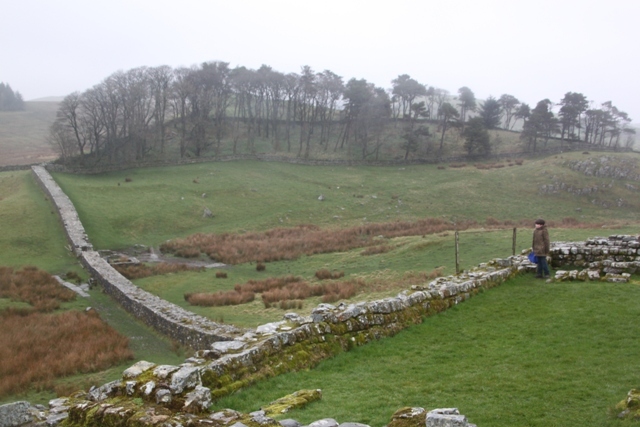 We spent time at Housesteads and Vindolanda – 2 Roman forts built on the wall, both fascinating and great places to find out about the soldiers who built the wall and their families who once lived here. 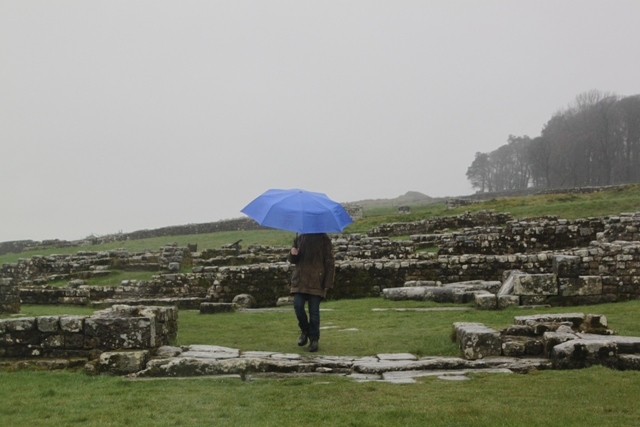 Son particularly enjoyed Vindolanda – a friendly tour guide, some recreations of Roman houses and shops and a quirky museum did it for him. At one time fought over by the Scots and English, at another time prone to Viking raids this whole area was very heavily fortified. Great for us now because you can find ruins and more extensive castles to explore just about everywhere you go. 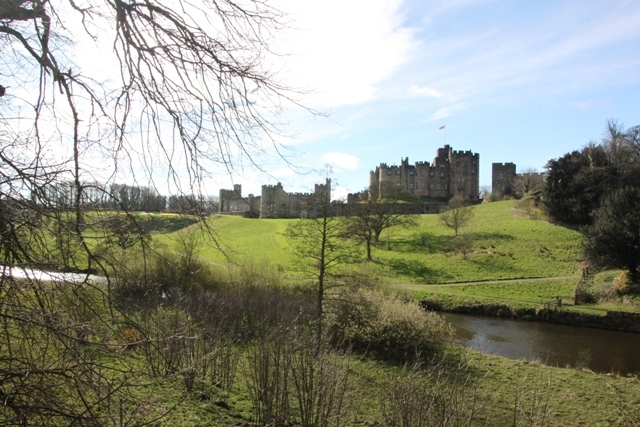 We opted for Alnwick Castle and spent a fabulous day at the home of the Duke of Northumberland. There is historical stuff aplenty, gorgeous views around the castle but it is also a fun place for children with lots of hands-on activities. Oh, and not forgetting the Harry Potter connection – the first 2 movies were filmed here, so they naturally make a big deal of that. Son (and a reluctant Husband) even got to take broomstick flying classes in front of the castle – a memorable moment indeed. This city, the “gateway to the north” was our base for a couple of nights. Not an obvious choice maybe, but we loved the beautiful bridges and amazing architecture. There are lots of great museums, all very child-friendly – Son had to be dragged out of most of them. I loved the Quayside, strolling along the banks of the Tyne and watching the Millennium Bridge open and close was very cool. We found great and quirky places to eat and loved the buzz of regeneration going on in Newcastle. The Northumbrian coastline is spectacular with stacks of golden, deserted, sandy beaches. Tynemouth was our favourite coastal town. 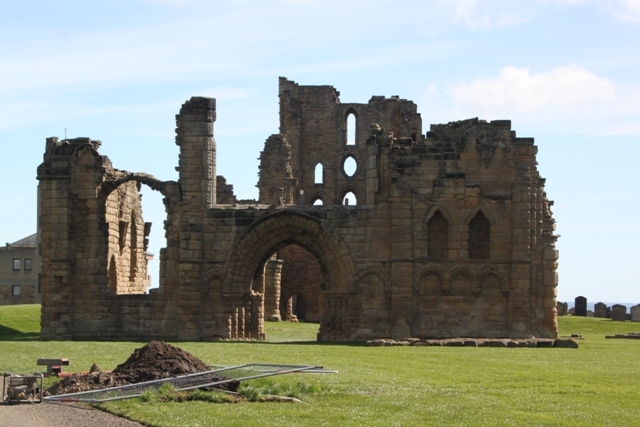 We explored the priory – history and stunning sea views and then spent ages on the (deserted) beach. Son’s idea of heaven, the bracing wind and cool sea air did not bother him one bit. My take-away memory of Northumberland though is the swathes of beautiful, unpopulated countryside – this is truly an unspoilt place. We all loved it and after 5 days none of us wanted to leave. It is rugged and wild, a remote and gorgeous part of England. The weather tended to be equally rugged and wild, but it didn’t bother us (much), this was a great Easter break. Thank you! We didn’t know this area at all, but loved it so much we are really keen to go back and explore some more. I studied in Durham (back in the 1990s!) so I love the Northeast – thanks for a great article. 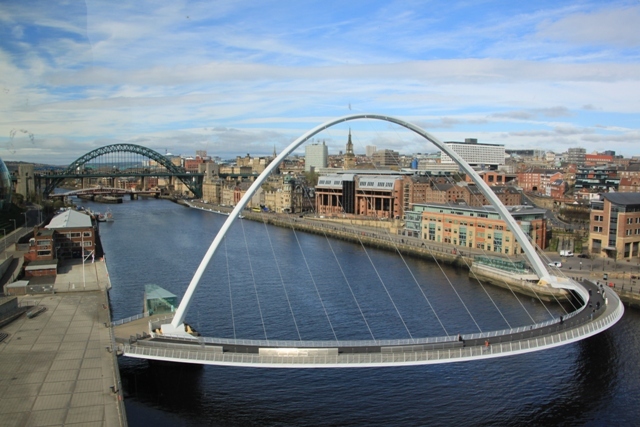 Makes me want to book a mini break in Newcastle immediately….it’s still one of my favourites cities! 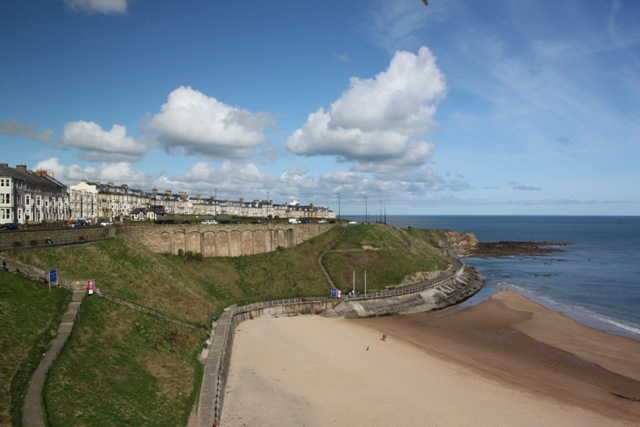 Very nice pics of Tynemouth…. 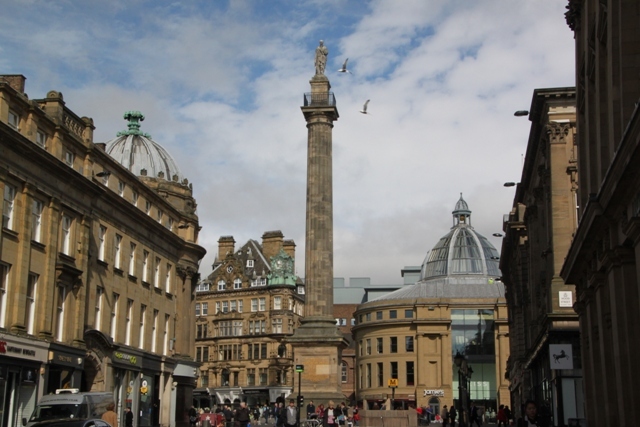 I was surprised by Newcastle and how much we loved it there – it is definitely a great place to visit. Been to Durham a few years ago – must have been great to study there too! Thanks for reading. I love the photos too! We always loved traveling in Northumberland. 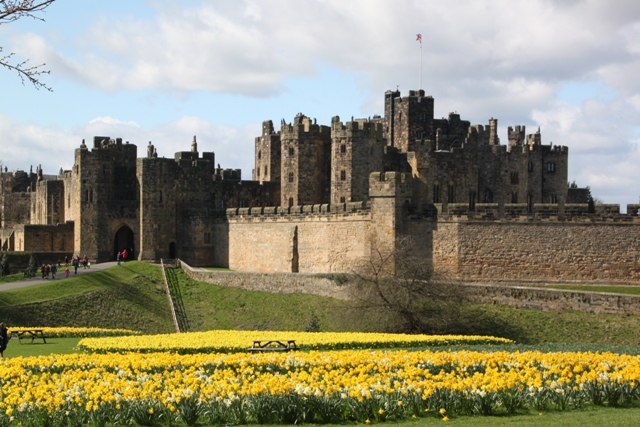 Our kids were young and really enjoyed Alnwick and the Harry Potter activities there. My husband and I especially enjoyed Lindisfarne (Holy Island). Thanks for the photos and the memories–what a great way to start my Friday! This area is definitely on my list. Thanks for the good ideas and lovely pictures! We loved it there – had never been before, but definitely on our list to go back there again! Thanks for reading. Those castles and the bridges! Amazing! We may have to fit this into our trip… Also I am passing this along to my parents as they are heading to Ireland, Scotland, and northern England in a couple weeks as well! It’s such a beautiful area – the countryside is stunning and there is so much to see and do. We only scratched the surface but I would definitely recommend, we are already trying to see when we can go back! Adding all of this to our bucket list! What a fun holiday. It’s a great place, so much to see and do – we only scratched the surface and definitely want to go back. That is such a great area for exploration and it looks like you packed lots of interesting places into your trip. I am a particular fan of Hadrian’s Wall, which we have visited a few times. We hiked it when we had a toddler and a baby (in stages) which was so much fun. We’d never been before – no idea why as I loved it. 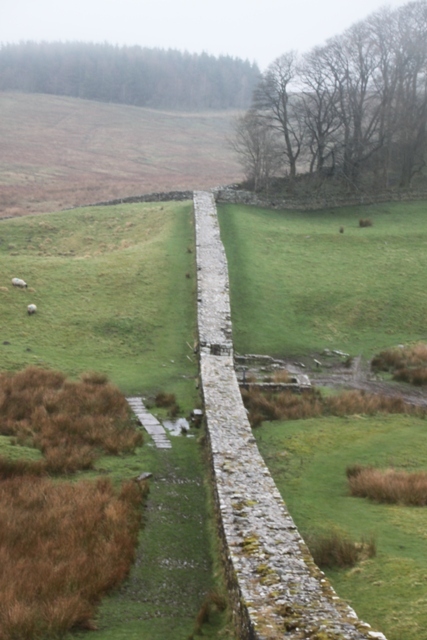 Hadrian’s Wall was wonderful, definitely want to go back there. Have a great weekend! Beautiful! I love the mist rolling in amongst the ruins. Picturesque. We would have hoped for better weather, but actually the misty wet gloominess really added something! Have a great weekend. Would love to see Carcassonne – I read a thriller set there once and have always wanted to go, thank you for the tip Kamila! Enjoy your weekend too. I love Alnwick castle. Did you visit the gardens there? They have the best rose garden I’ve ever seen and a poison garden which is kept under lock and key and can only be visited on a guided tour! Another fabulous castle in Northumberland is Bamburgh Castle. The beach there is also completely unspoilt and almost deserted. Then there’s Holy Island…I could go on and on! I think Northumberland is one of Britain’s best kept secrets. Oh, I can also thoroughly recommend Carcassone. I adore that whole area of France. I assume you’re referring to Kate Mosse’s Labyrinth, Sepulchre and Citadel novels. Rennes-le-chateau features in Sepulchre and is a really interesting place too. A couple of years ago we went to the Aude department of the Languedoc and visited lots of Cathar castles which are all perched on top of really steep mountainsides. Great stuff! We had a fantastic day at Alnwick Castle and gardens – still sorting the pictures out but a post is somewhere in the pipeline. The poison garden was my favourite part. Unfortunately we didn’t get around to Bamburgh Castle or Holy Island but I definitely want to go back and visit sooner rather than later! I totally agree, we were blown away by Northumberland but it seems to be somewhere most people don’t get to see. Maybe that’s a good thing….. Yes, big fan of the Kate Mosse books and so keen to visit that area too. Thank you for the suggestions Margarita, they will definitely go on my list! Another vote for Bamburgh Castle and the adjacent beach. There is so much to see in Northumberland, one trip is never enough. For example; Berwick on Tweed, Holy Island, (as mentioned) Farne Islands, (for seals and puffins) Northumberland National Park & Kielder Water, Warkworth Castle and many more attractions. Thanks for reminding us of how enjoyable it was visiting Hadrian’s Wall and the Roman Forts along it. The photo’s are very good and atmospheric with the mist and rain in them. Great suggestions – thank you so much, we are already trying to schedule in our next Northumberland jaunt! Farne Island is one I’d never thought of before but love the idea of seeing seals and puffins. Will put all of them on my list though, really appreciate the suggestions. Forgot to mention the Farne Islands can be sailed to as an excursion from Seahouses.